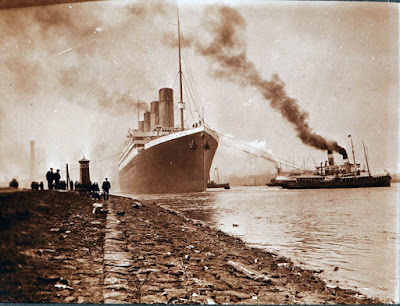 TITANIC: History's Most Famous Ship: March 31, 1912: TITANIC - The Largest Ship in the World is Completed! 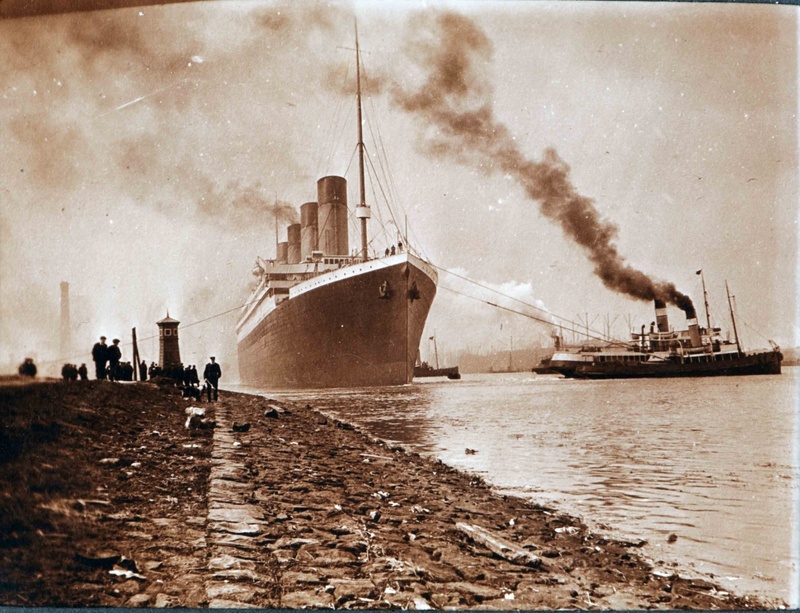 March 31, 1912: TITANIC - The Largest Ship in the World is Completed! At 882 feet 9 inches long and 92 feet 6 inches wide, she had the same dimensions as her older sister. Her hull was built with 2 thousand 1 inch thick steel plates, held together with over 3 million rivets. Her displacement weight is 52,310 tons, even more than Olympic at 52,067 tons, making Titanic larger. Titanic had three main anchors, one for each side of the bow, and with a central anchor stored in reserve on the forecastle deck. The port and starboard bow anchors weighed 7 7/8 tons each, and the central anchor weighing 15 3/4 tons. The bow anchors were raised and lowered with 96 tons of anchor chain. 29 boilers will produce enough steam to power her 3 story tall reciprocating engines and single turbine, generating up to 46 thousand horsepower total. The port and starboard reciprocating engines turned the outer wing propellers, both at 23ft. 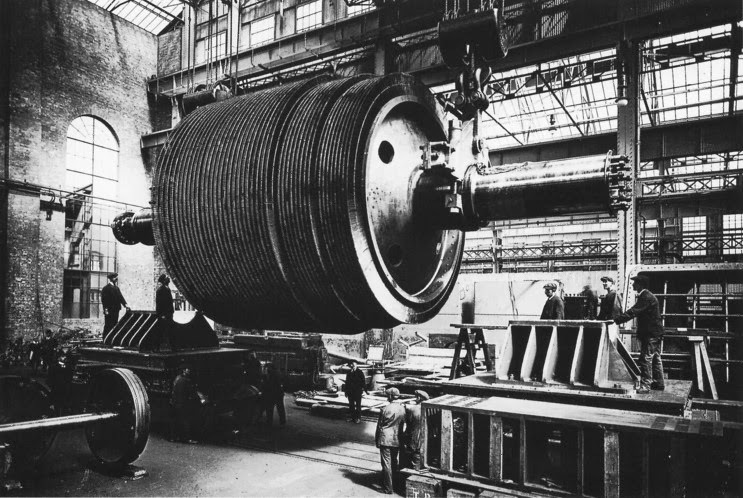 in diameter, and the single turbine turned the center propeller which was 16ft. in diameter. 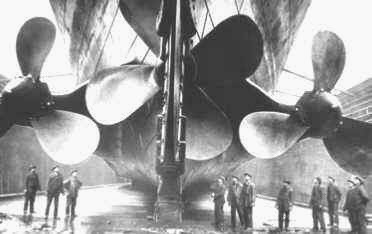 Titanic and Olympic were called "triple screw steamers" because they had three propellers. Boilers waiting to be installed on Olympic and Titanic. 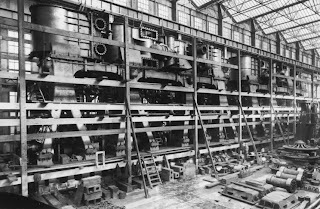 Titanic's Engines waiting to be installed. 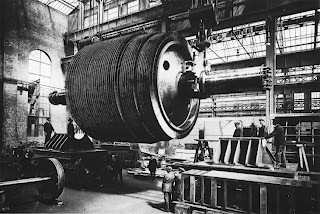 Titanic's Central Turbine Rotor at Harland and Wolff. Olympic's Triple Screws. Almost identical to Titanic's. The cost of building and equipping Titanic came to 1.5 million British Pounds or 7.5 million U.S. Dollars. Nearly 195 million U.S. Dollars by today's standards. 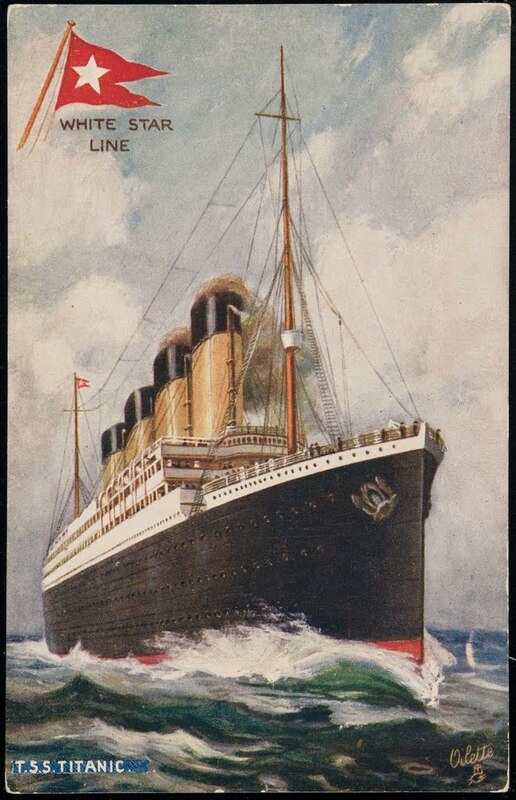 The White Star Line expects a glorious return on its investment.